With the increasing use of the internet and new communication technology, comes the need to provide a safe online environment for children. One aspect of this is to build up children’s capacities to stay safe online. The CyberSafe program is Stairway’s contribution to the online safety field. 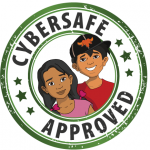 The CyberSafe website aims to provide guidance to children, youth, parents, teachers, caregivers and anyone interested on online safety. At the end of the day, we want children to have fun in a safe, online environment. #BeCyberSafe is the product of the collaboration among The Department of Education, Stairway Foundation, and the Internet and Mobile Marketing Association of the Philippines (IMMAP). The project aims to inform, educate learners, teachers, parents and the school community on how children can be safe online.